4 Ways To Further Stretch Your Savings At The Grocery Store! You are here: Home / Great Deals / 4 Ways To Further Stretch Your Savings At The Grocery Store! 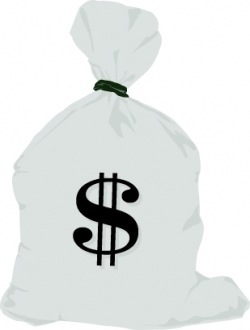 We all know that we can save MAJOR bucks with coupons at the grocery and drug stores. But, what other ways are there to add to our savings at the grocery store? Well, here are a few things I have done over the years to further lower my grocery bill. Lunchmeat is so expensive unless you can find a really good deal on it. I look for a canned ham – no, really! I take that to the deli and have them slice it thin and I take it home and bag and freeze the majority of it and it will last for quite some time and is usually much cheaper than lunch or deli meat – make sure to do the price comparison though to make sure you are getting a good deal! When I had babies in the house, I bought alot of apple juice. I learned with my daughter however that it gave her a severe diaper rash, so I came up with a plan to combat that and save. I bought frozen apple juice and I would keep a can in the freezer and when I needed to make her some juice I would scoop out about a 1/4 to a 1/2 teaspoon – just enough to sweeten it for her and added water and she was happy with the taste and I was happy with no diaper rash and the 1 can would last a looong time! I used white grape juice with the 3 boys that came after my only daughter – same way though! 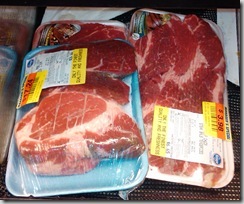 Meat – most stores have what we call a “cheap meat” section and I always check there before I purchase any meat. 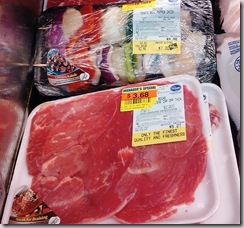 I check there when I don’t plan to purchase any meat – because it is just a really good deal. I can find great deals there. Another thing we have done in the past when purchasing our meat was to buy it in bulk at the butcher. 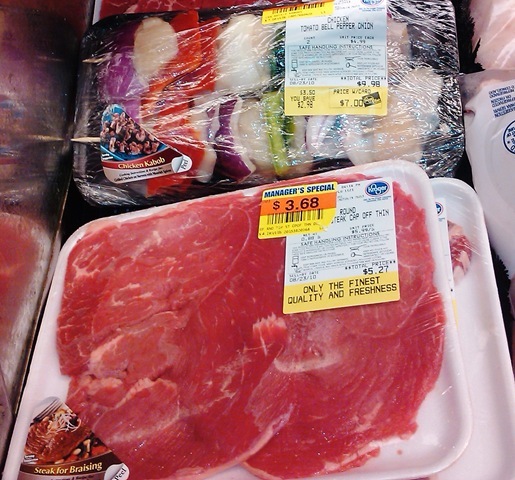 Our butcher has great deals on all kinds of meat in packages that last us 6-9 months! Usually to entice you to purchase they will give you a freezer to keep it in or a grill or smoker to cook it with! Some places will even do a payment plan, so look into that and you won’t have to worry about purchasing meat for 6-9 months at a time! I LOVE it! I love my freezers – I have a chest freezer, a box freezer and 2 fridges I keep all my goodies in! I freeze butter, biscuits, bread, milk, pretty much anything! So, next time your at the grocery store – think outside the box – and try to find a way to further stretch your savings! What things have you come up with to make your savings even better at the grocery store? Neat tip on the juice Dian. I can’t have juice due to the acid, but I will have to keep that in mind for someday when I have kids. I water down my kids juice too! Thankfully they love milk and water just as much as juice. I can tell where you shop by your meat! 🙂 Love the manager’s markdowns! First thing I look for when I shop. 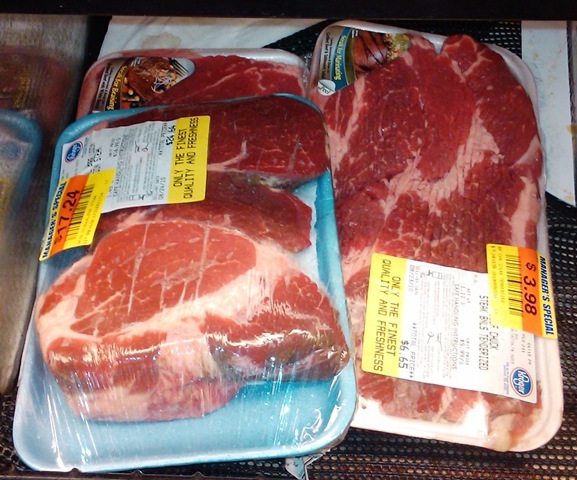 I bought some porterhouse steaks for $4.50/lb. tonight- a tasty treat for us! I am seriously looking into buying beef in bulk from a local farmer who raises beef with no hormones/antibiotics though. Need to get myself a big freezer though! @Renae @ Madame Deals: The butcher we use has us come in the back and mark all the packages as they cut the meat and package it in front of us. I love that!